Tuesday, February 10, 1920 Mrs. McLeod and Sue came with me to the station. I left at 10.25 for Delavan. Had a comfortable trip for a local train. Reached Delavan at 4.45. Mr. Albers met me as the folks had directed. Was glad to get back. A good supper and visit before bed time. Letters from Hattie, Ida & Ann Henslee. Wednesday, February 11, 1920 Worked at my crochet in forenoon. Wrote Hattie and cards to Cousin Jen, Alice Sue and Aunt Sarah & took them to the depot. Vene to the funeral of an old lady near by. Thursday, February 12, 1920 Fourteen months today and same day of the week since we put Dear Will away. I looked over papers and crocheted. Friday, February 13, 1920 A cold day. I read my papers in forenoon and worked on Venes spread in afternoon and evening. Saturday, February 14, 1920 A very cold unpleasant day. Laura went to Peoria. I crocheted some. Wrote Hattie and sent papers to Aunt Sarah. Vene and Edith busy with the work. Sunday, February 15, 1920 Still cold. I read the papers some. Wrote Winnie Laurence. We had our dinners in the kitchen. Laura went to church. 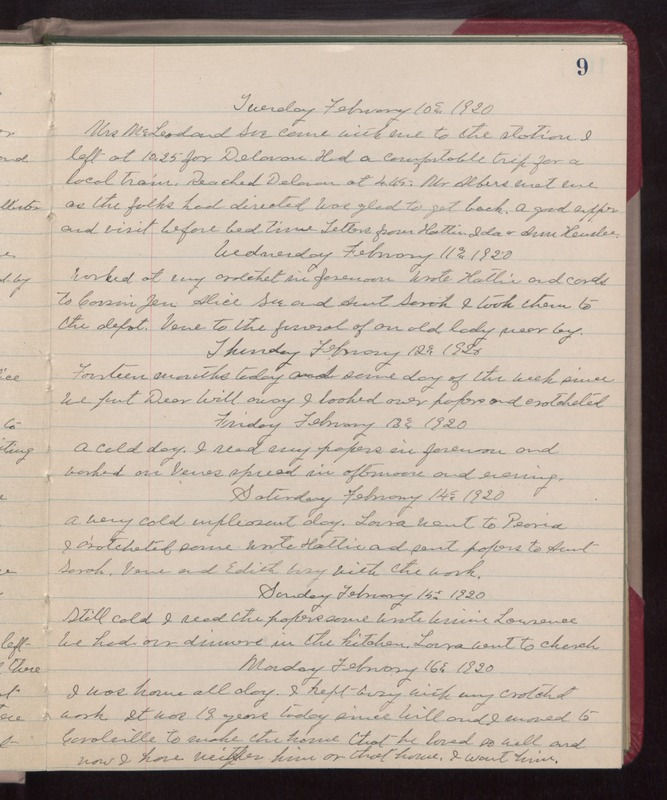 Monday, February 16,1920 I was home all day. I kept busy with my crochet work. It was 19 years today since Will and I moved to Coralville to make the home that he loved so well and now I have neither him or that home. I want him.